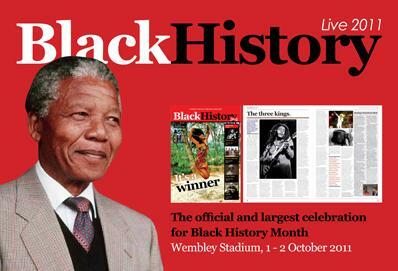 Black History Live will launch the start of Black History Month 2011 at the iconic Wembley Stadium on the 1st and 2nd of October 2011. BHM is celebrated in the UK in October. It will be a fun-packed day for all the family with...the kidszone, bookzone, cultural workshops & seminars, live acts, shows & entertainment plus a special appearance from Levi Roots...there’s just so much to see and do. Bookzone Visit Centerprise Bookstores and meet their amazing speakers. Kidzone Fantastic workshops for young people including the art of storytelling and arts and crafts with Tokunbo Ifaturoti, the force behind childrens TV programme ‘Time Out With AuntieToks!’. Cultural Workshops and Seminars Running throughout the day including; 'Cracking the Kora' with Tunde Jegede, A talk by Former Black Panther Robert King who spent 29 years in solitary confinement in America for a crime he didn't commit. Film: 'Tales from the Front Room' A screening of the BBC4 documentary. Director Dr Michael McMillan, Editor of 'The Front Room: Migrant Asthetics in the Home' will be available for discussion afterwards. Bring items from your front rooms and share your stories.